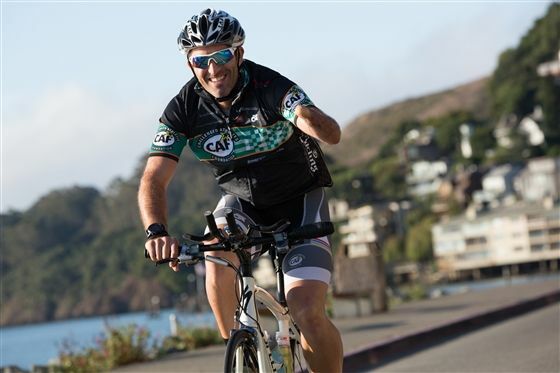 Danny Gabriel '92 has been a one-handed athlete all his life, and he's committed to encouraging others with physical challenges to achieve their goals. “I look at being born with one hand as a blessing,” says Danny Gabriel ’92. This positivity and gratitude is the way Gabriel leads his life. As a former high school and college athlete, he has spent nearly 15 years dedicated to supporting and advocating for athletes with physical challenges. Gabriel was born limb deficient—without his left hand—and he’s viewed this challenge as advantageous to developing the grit and work ethic that has helped him achieve excellence throughout his life, including as a lifelong athlete. At La Jolla Country Day School, Gabriel competed in three sports: soccer, tennis and cross country. He excelled in all three and received numerous accolades, including the player of the year in both soccer and tennis in 1992. LJCDS honored his achievements and contributions to the athletic program by inducting him into the LJCDS Athletic Hall of Fame in 2009. Not only has Gabriel served as an advocate since his first introduction to CAF in the early 2000s, he has also been an active participant and fundraiser. In 2017, Gabriel and his family pledged to support a six-month fundraising campaign for CAF from August 2017 through February 2018. They raised more than $120,000 for the foundation across three events, kicking off with Gabriel’s participation in a 300-mile cycling challenge in Northern California. Several years ago, he introduced the LJCDS student Community Service Board to the Challenged Athletes Foundation. Now, the school holds an annual soccer tournament benefiting CAF: Fly’s Four-on-Four, named in honor of Upper School history teacher and men’s varsity soccer coach Jerry Fleischhacker. Fleischhacker was Gabriel’s soccer coach his senior year. Giving back is an important priority for the Gabriel family. As part of their campaign pledge, the family participated in the 14th annual CAF Triathlon Challenge in fall 2018. Gabriel’s wife, Dana, and their three daughters, Sadie (10), Zoe (8) and Vanessa (5), participated in the 5K run, while he and son Jake (12) combined forces to tackle a one-mile ocean swim before Gabriel finished off the challenge with a 40-mile bike ride and a 10-mile run. Each year, Gabriel commits to raising $75,000–$100,000 for the organization to support programs, including camps, clinics and grants. In 2018, the foundation offered $4.3 million in grants to more than 2,000 individuals for adaptive equipment, coaching, mentoring and competition expenses. Gabriel balances his philanthropic commitments with his job as the CEO of ColRich Multifamily, a real estate development and investment firm. In addition to supporting CAF, Gabriel serves on a board at Scripps Memorial Hospital. He and his family also support nonprofits in Tijuana, building homes and helping in orphanages, among other service work.